Who would not be inspired after looking at all the layouts for this challenge?! Each and every one was beautiful and so heart-felt which made choosing just one favorite so tough. But after looking at all the entries the one I chose was Donna's Right Now layout. The dark background really brings out the all the wonderful colors on the page. 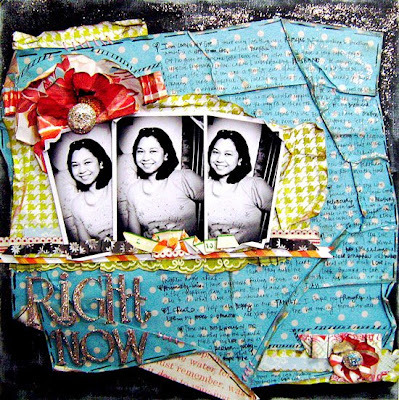 The paper-tearing, layering, and distressing give so much texture and dimension. Overall it's just a really impressive, balanced, and well-designed layout! Fabulous work, Donna! !